It’s time to be outdoors enjoying the warmth of the summer sun. New outfits, different shades of makeup, and of course…new hairstyles to try on! Check out these 24 head-turning long hairstyles for summer and be seen with fabulous hair this season! This hairstyle is parted to the side with waves and prominent ridges that eventually straighten towards the ends. Apply a product for texture on wet hair. Power dry hair with a blowdryer and hands. Wrap sections of hair with a curling wand leaving the ends out. Scrunch a product into the hair to add more texture. Set the style with a finishing spray. Spray Wax by Paul Mitchell gives hair definition and texture. All face shapes that are medium in density and texture will suit this hairstyle. Feel and look extra feminine by detailing your summer hairstyle with a simple braid. Apply a thermal protection spray to hair. Curl sections of hair using an extra-large curling wand. 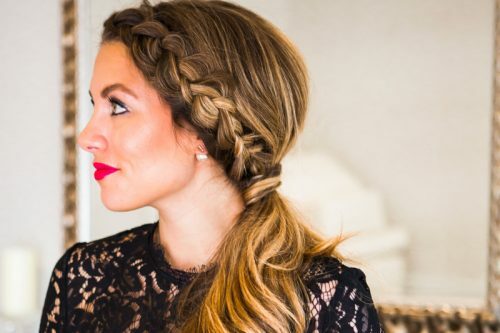 Braid the front pieces of the hair backwards. Join both braids together in the back and secure with an elastic band. If the ends don’t reach, secure them with a bobby pin on each side. Set with a finishing spray. Hot Off The Press by Paul Mitchell protects the hair from the heat of the iron and gives the hair hold. Have some extra fun with your beautiful naturally curly hair by loosely pigtailing them on each side. Apply a styling product to wet hair. Air dry or diffuse the hair until it is completely dry. Loosely gather and secure hair into a ponytail on each side of the head. Twirl Around is a combination of gel and conditioner that will give hair defined yet touchable soft curls. Wider face shapes that have hair that is naturally curly will suit this hairstyle. Leaving the ends straighter than the rest of the hair gives this long hairstyle a more current-looking organic texture. Apply a product to create some grit and texture on wet hair. Wrap sections of hair around a large barrel iron, leaving the ends out. Loosen waves by combing fingers through the the hair. Scrunch and rough up the hair with fingers and a product for texture to make the waves look more organic. Lived In by Pravana is a powder that adds texture and volume to hair. All face shapes with hair that is medium in texture and density will suit this hairstyle. This simple ponytail is clean, chic, and will make you feel like you’re walking down a New York Fashion Week runway this summer. Apply thermal protection to hair. Apply a serum to hair for shine. Gather all the hair into a clean and sleek ponytail. Secure with a clear elastic band. Tame any frizz and flyaways with a wet finishing spray. Soft Spray by Paul Mitchell is a wet spray that holds down any frizz and flyaways. Oval face shapes with hair that is medium in texture and in density will look best in this style. 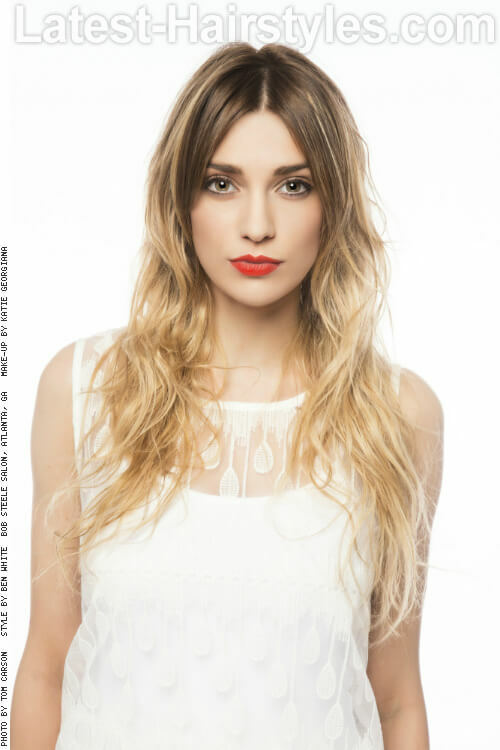 Channel your inner rockstar with this super cool, carefree-looking summer hairstyle. Apply a volumizing mousse to wet hair. Section the hair into small to medium-sized sections. Braid each section and secure with an elastic band. Air dry or wear the braids to bed. Once the hair is completely dry, remove the elastics. Scrunch hair with a texture product. Paul Mitchell’s Volumizing Sculpting Foam will give your hair effortless volume. This long haircut is parted to the side and is styled sleek, smooth and shiny for a classic look. Apply styling product to wet hair. Blow dry the hair smooth with a styling brush. Smooth the hair with a flat iron. Apply a serum for shine. Hot Off The Press is a thermal protection spray that has hold. It protects hair from heat and helps the style last longer. This summer-perfect hairstyle is a combination of being organic and structured. It’s very editorial yet wearable. Apply a styling product to hair. Blow dry the hair straight with a flat brush. Curl sections of hair starting three inches away from the roots, leaving the ends out. Set the style with a flexible hold spray. Hold Me Tight is a hairspray with long-lasting flexible hold. Longer face shapes with hair that is medium in texture and density will suit this hairstyle. This texture is so beautiful left natural and is the perfect effortless look for summer. Apply a leave-in conditioner to hair. Air dry or diffuse hair until it has completely dried. Full Circle Leave-In Treatment by Paul Mitchell keeps curls soft and frizz-free. Perfectly imperfect ponytails give you that girl-next-door look with a dash of sexiness while keeping cool this season. Apply a volumizing product on dry hair hair. Gather all your hair into a high ponytail by raking fingers through the hair. Secure your ponytail with an elastic band. Hold Me Tight by Paul Mitchell gives hairstyles like this a long lasting flexible hold. 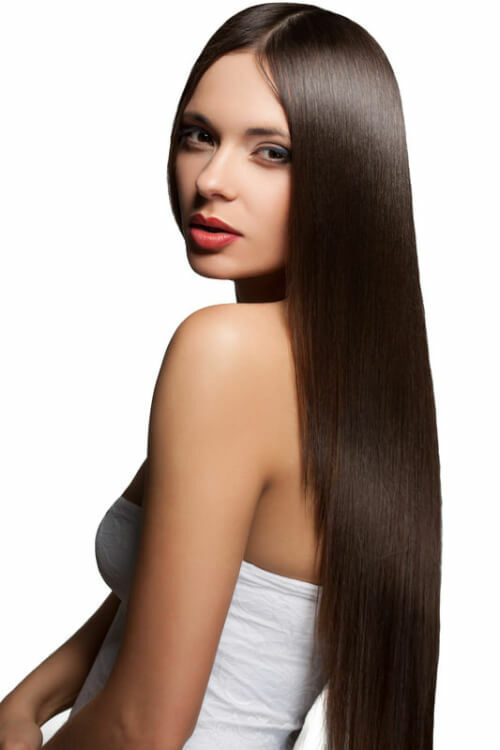 If you have naturally straight hair, why not flaunt it by making it extra-straight and polished? The sun won’t be the only thing shining this summer! All face shapes with hair that is medium in texture and density will suit this haircut. This summery long hairstyle is parted down the middle with loose, soft and natural-looking waves. Apply a styling product to wet hair for volume. Wrap sections of hair around a large barrel iron. Apply a texture powder on the roots and massage the scalp. Pravana’s Lived-In Powder Potion gives hair natural-looking volume and texture. This hairstyle has beautiful waves that are left straight on the ends for a very on trend, chic finish. Blow dry sections of hair upwards to create volume. Curl sections of hair a few inches away from the roots, leaving the ends out. Apply a product for texture. Apply a product for shine. AG Texture gives hair texture and helps defines waves without weighing the hair down. This hairstyle is a loose braid secured without an elastic, giving it a more organic look which is totally on trend this summer. 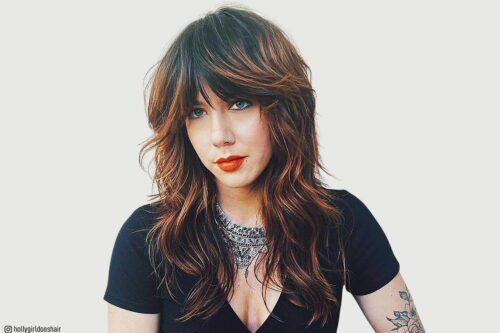 Start out with naturally wavy hair or put waves into the hair using curling wand. Pull hair to the side. Divide hair to be braided into three sections. Start braiding hair as usual, but without fully separating the strands at the bottom. Continue to braid the strands without pulling them through. You’ll notice that the hair at the bottom will start to braid together. When the top braid meets the bottom braid, make a loop in the center where they meet and pull the lower half through to secure the braid. Paul Mitchell’s Hold Me Tight is a flexible hold spray that has long lasting hold and is perfect for loosely braided styles like this one. You can never go wrong with these beautiful, classic looking waves. Apply a volumizing product to wet hair. Wrap sections of hair around a large curling wand all to one direction. Have the lighter side of the part all curl backwards. Work your way to the other side. The hair on the heavier side of the part will end up curling toward the face. Once all the hair has cooled, brush through the curls until they form into a wave. Finish with a flexible hold spray. Hold Me Tight by Paul Mitchell gives the hair long lasting hold while keeping it touchably soft. This hairstyle is timeless. You definitely can’t go wrong with high shine classic curls this summer! Spray thermal protection to hair. Curl sections of hair vertically in one direction using a medium barrel iron and set them in Velcro rollers. Once the hair has cooled, remove the rollers and brush out the curls using a boar bristle brush. Use a wet hair spray like Soft Spray by Paul Mitchell. It takes longer to dry which allows you time to manipulate the hair. It is also wet enough help smooth flyaways. 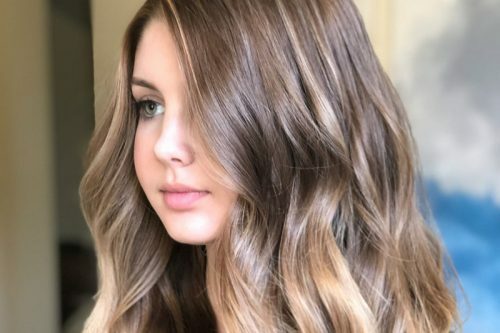 These big bouncy curls with ribbons of very natural-looking balayage highlights are just too gorgeous! Curl the hair using a large barrel iron. Spray on shine to avoid disrupting the curls. Shine Spray by Paul Mitchell allows you to add shine to the hair without having to touch the hair. All face shapes with hair that is medium to thick in density and medium in texture will suit this hairstyle. 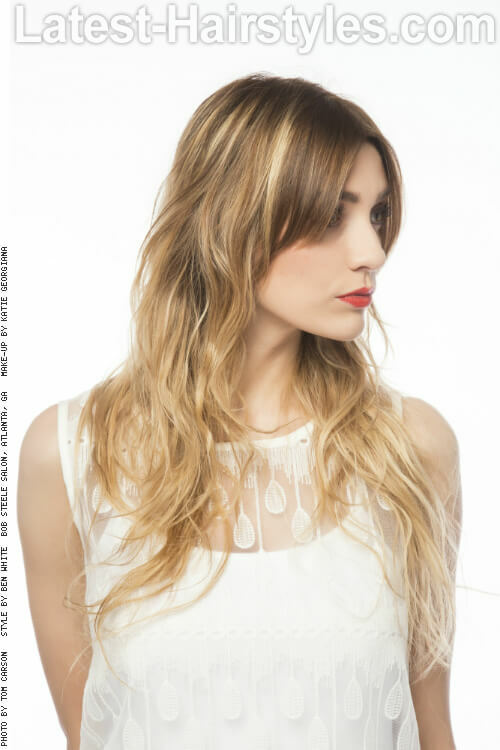 This gorgeous long haircut is styled with retro-looking waves with very prominent ridges. Spray a thermal protection spray on hair. Wrap sections of hair around a curling wand all to one direction. Once all sections of hair have been curled, brush through the curls using a dressing brush. Make the ridges more prominent by lightly teasing upward right beneath each one. Soft Spray by Paul Mitchell is a non-aerosol hairspray with a wet delivery. Because of this, it gives time for the hair to be shaped and holds down frizz and flyaways. All face shapes with hair that is medium in texture and in density will suit this hairstyle. Mermaid hair is hot for summer. This is definitely one to try! Wrap sections of hair around a curling wand all towards the face. This hairstyle features hair that is big and bouncy towards the ends. The hair is pulled back from the face one side for a trendy finish. Curl just the ends with a medium barrel iron. 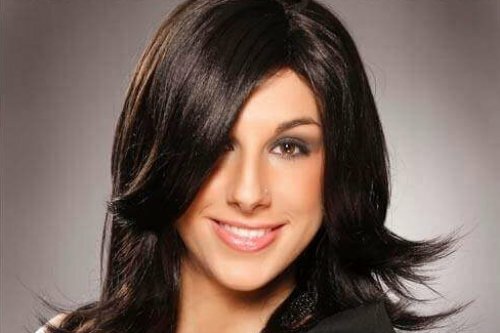 Hot Off The Press protects hair from the heat of irons and is a must for styles like this one. These curls are focused more on the midshaft to the ends and curled towards the face for a feature flattering finish. Curl the mids to the ends of the hair. Hold Me Tight gives hair long lasting flexible hold. Wide face shapes with hair that is medium to thick in density and medium texture will suit this hairstyle. These glossy curls are coiled together, giving the overall look a classic feel. Curl sections of hair all in one direction. Twirl the curls together until they coil into one big curl. Gloss Drops add luminous shine to hair. All face shapes with hair that is medium to thick in density and medium texture will suit this hairstyle. These big, bouncy, springy curls are fresh, fun and very youthful looking. Set each curl with pin curl clips. Once cooled, remove the pin curl clips. Hold Me Tight allows the curls to have movement and bounce while giving the curl long lasting hold. 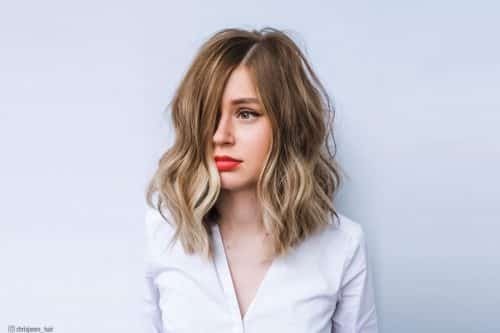 This soft and very feminine hairstyle features curls that are worn over the shoulder with just a few tendrils hanging on the other side for a flirty finish. Curl the hair using a medium barrel iron. Wear hair over one shoulder, leaving some tendrils on the other side. Super Clean Spray gives hair long lasting flexible hold and texture. Don’t just look fabulous this season, but feel make sure to feel extra extra fabulous with one of these stunning long hairstyles for summer!